". 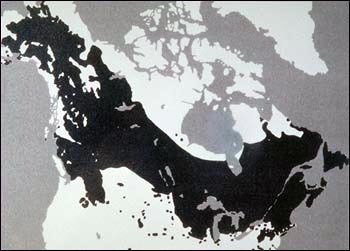 . . better known in the canoe fraternity as the canoe birch, [it] extended from Maine to central Alaska. 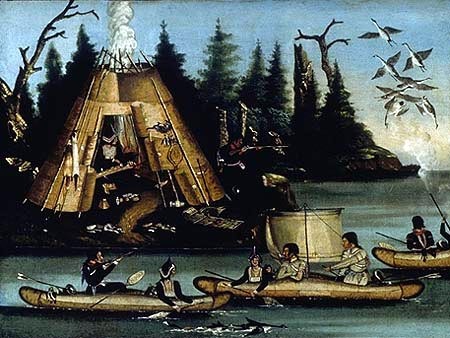 The quality of the bark varied greatly, as did the size of the trees; while one thick sheet of birch bark might serve for a large Huron canoe in the south, some very small Déné canoes in the northwest were patched together with ten or twelve pieces of thin bark." K. G. Roberts and P. Shackleton, The Canoe: A History of the Craft from Panama to the Arctic (Toronto: Macmillan, 1983), p. 156.
he canoe was an essential element of Aboriginal hunting encampments across Canada, both for travel and gathering game. In the Maritimes, this style was well adapted to either coastal waters or shallow rivers.